The IPCC’s Fifth Assessment Report’s Working Group II (AR5 WGII) issued their report today. I do agree with some of the opining characterizing the report as ‘alarmist’ – from the standpoint that I don’t think there is enough information presented simultaneously regarding opportunities for action. People don’t respond well to persistent negative messages. Would climate activists subject their children to daily messages of upcoming death, devastation, and the collapse of civilization? If not, then why do they think adults are any better at handling the same messaging? That said, I believe that scientists settled the science years ago. I think it is highly unlikely scientists will identify anything fundamental to change that science in business as usual activities. What will change is the climate’s response to activities changed by policy. With new and updated policies, mitigation and adaptation will occur. Therefore, I spend as much or more time on policy discussion than science discussion, using the science as my foundation. As the picture on this blog emphasizes, I operate as a bridge between these two distinct sides of the problem. Scientists typically don’t understand policy processes (to the point they eschew social science findings and believe physical scientists should exclusively inform and decide policy), while policymakers continue to ask for more actionable information. What follows is a summary of high-level results (Summary for Policymakers) from this new report. I want this post to serve as something I can point to repeatedly in the future for these results. 2. In many regions, changing precipitation or melting snow and ice are altering hydrological systems, affecting water resources in terms of quantity and quality (medium confidence). 3. Many terrestrial, freshwater, and marine species have shifted their geographic ranges, seasonal activities, migration patterns, abundances, and species interactions in response to ongoing climate change (high confidence). 4. Negative impacts of climate change on crop yields have been more common than positive impacts (high confidence). 5. At present the world-wide burden of human ill-health from climate change is relatively small compared with effects of other stressors and is not well quantified (small-medium confidence). 6. Differences in vulnerability and exposure arise from non-climatic factors and form multidimensional inequalities often produced by uneven development processes (very high confidence). These differences shape differential risks from climate change. 7. Impacts from recent climate-related extremes, such as heat waves, droughts, floods, cyclones, and wildfires, reveal significant vulnerability and exposure of some ecosystems and many human systems to current climate variability (very high confidence). 8. Climate-related hazards exacerbate other stressors, often with negative outcomes for livelihoods, especially for people living in poverty (high confidence). 9. Violent conflict increases vulnerability to climate change (medium evidence). Number 6 tells me that differential risk can be reduced by helping developing countries develop more quickly. They will bear the early and severe brunt of climate change effects despite contributing the smallest portion of anthropogenic climate change forcing. Despite this, most climate activists want to keep these countries in their current state by preventing them from industrializing. Number 7 is relevant to the climate activist vs. Pielke Jr. brouhaha (which activists claim means very little to them at the same time they issue post after post and tweet after tweet regarding their personal opinion of Pielke). The IPCC states: “For countries at all levels of development, these impacts are consistent with a significant lack of preparedness for current climate variability in some sectors” (emphasis mine). What this tells me is human systems are vulnerable to today’s climate, which has a small fraction of human influence (read: overwhelmingly most influence is natural). The focus then should be on preparing for today’s climate variability as primary steps toward dealing with tomorrow’s variability. I don’t hear enough from today’s climate activists how today’s infrastructure can’t handle today’s climate variability. Most of what I hear deals with 2050 or 2100 – dates when most of us will be dead. Why not focus instead on today’s infrastructure, which we know are deficient? Indeed, this is exactly what the report suggests we do. 1. Adaptation is becoming embedded in some planning exercises, with more limited implementation of responses (high confidence). 2. Adaptation experience is accumulating across regions in the public and private sector and within communities (high confidence). Governments at various levels are starting to develop adaptation plans and policies to integrate climate-change considerations into broader development plans. 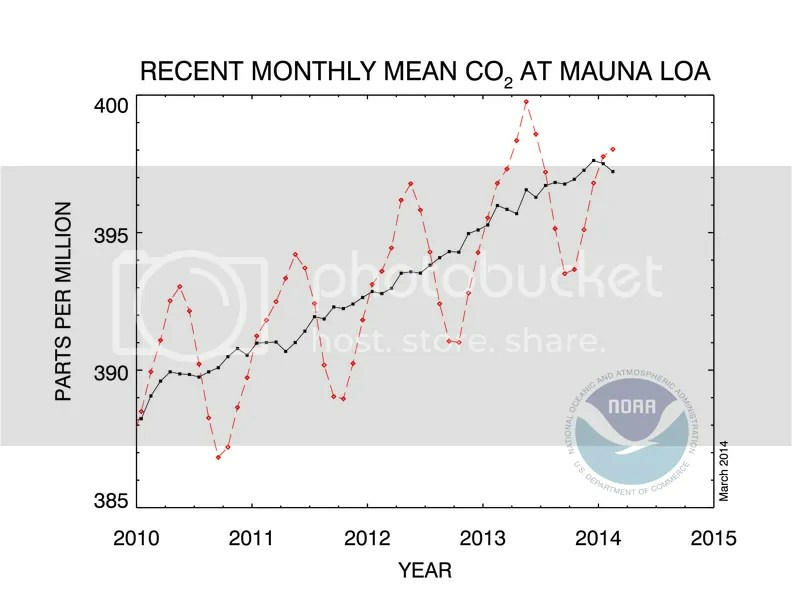 It’s late in the <2C warming game for these adaptations to take place, but at least people are initiating them somewhere. Municipalities and collections thereof are the hotspot for climate adaptation and mitigation plans and policies. In the US, national policy is virtually nonexistent. My hope is that local policies grow in scale. We need to start evaluating plans and policies to inform additional locales as well as scale them up for larger governmental entities – how do they need to change for state and regional levels, for instance? I’ll have more on this and related topics in the future as I continue to read through the report. Categories: environment, framing, global warming, meta, policy, science | Tags: climate policy, climate science, IPCC AR5 WGII, physical science, social science | Permalink. The only way we will take large-scale climate action is if there are appropriate price signals in markets – signals that reach individual actors and influence their activities. One step in the right direction was phasing out federal subsidies for high-risk coastal properties’ flood insurance policies, as Congress did in 2012. This had the expected effect of increasing premiums for policy holders. Unsurprisingly, people don’t want to pay more to live in their high-risk homes. So they complained to their representatives, who responded by passing new legislation … reinstating government subsidies. Taxpayers across the country are shoveling good money after bad for a select handful of wealthy people to build without mitigating risk to their homes or paying the true economic costs of their lifestyle decisions. We will pay for them to rebuild again and again (remember: sea levels will rise for centuries) unless we as a society decide to stop. Tesla is entering the energy industry. This could be a game changer in terms of home solar energy and electric vehicles, no matter how Tesla comes out in the long-term. 20 years of IPCC effort and “achievement”. With no robust international climate agreement after 20 years’ of work, I have a hard time accepting the claim the IPCC has achieved much of anything except an excessive bureaucracy and huge reports that few people read. News that’s not really news: Asia will be among those hardest hit by climate change. This isn’t a new result, but something that the IPCC’s WGII report will report on with increased confidence in 2014 versus 2007 (see above statement). The number of people living close to coasts in Asia dwarf the total population of countries who historically emitted the most greenhouse gases. That was true in 2007 and will be true in the future. It will take a generation or more before effects on developed nations generate widespread action. New research (subs. req’d) indicates ice gains in Antarctica’s Ross Sea will reverse by 2050. Recent temperature and wind current patterns will shift from their current state to one that encourages rapid ice melt, similar to what the Arctic experienced in the past 20 years or so. An El Nino might be developing in the tropical Pacific. The anomalous heat content traveling east via an Equatorial Kelvin Wave rivals that of the 1997-1998 El Nino, which was the strongest in recorded history. Earlier this month, NOAA’s Climate Prediction Center issued an El Nino Watch, citing a 50% probability that an El Nino would develop in summer or fall 2014, based in part on projections such as Columbia University’s. El Nino is the warm phase of the ENSO phenomenon. Warm ocean waters move from the western to eastern Pacific, affecting global atmospheric circulations. Related to science policy, one result of Congress’ austerity approach to the economy is monitoring buoys’ degradation in the Pacific Ocean. NOAA helped deploy a widespread network of buoys following the 1982-1983 El Nino which helped track the progress of the 1997-1998 El Nino with greatly improved fidelity. That network is operating at less than 75% of its designed capacity, hampering observations. If we can’t observe these impactful events, we can’t forecast their effects. This negatively impacts business’ and peoples’ bottom line. Finally, I want to make some observations regarding goings-on within the climate activist community. Vocal critics recently spent a lot of energy on hit pieces, this being only one example (poorly written with little on science, heavy on “he-saids”, with an overdose of personal insults and vindictive responses to anyone who didn’t agree with the piece, including my comments). These writings demonstrate something rather simple to me: if you do not agree with 100% of what the activist consensus is, you’re no better than people the activists label ‘deniers’. Additionally, the their argument is absurd: social scientists have no business analyzing climate data or commenting on activist’s claims. Why is this absurd? Because they simultaneously hold the contradictory belief that physical scientists should have exclusive input and decision-making power over climate policy (a social creation). Furthermore, implicit in their messaging is social scientists don’t have the right kind of expertise to participate in “serious” discussions. These efforts to deligitimize someone they don’t believe should participate (how very elitist of them) is reminiscent of efforts by many in the Republican party to deligitimize Barack Obama’s presidency simply because of his race. Nothing is gained and much is lost by these efforts. How does this advance the climate discussion to people not currently involved, which will need to happen if we are to ever take any kind of large-scale climate action? I’ve said before that I think people can believe what they want, as long as they don’t try to act on those beliefs in a way that interferes with others’ lives. When they deny the reality of global warming, and preach it to their flock, that’s exactly what they’re doing (incidentally, a large fraction of Americans believe to some extent the Bible is literally true). The very same complaint is made by the people the author derides in this paragraph and post but in reverse and it’s one of the biggest reasons why we’ve taken so little climate action. The author’s condescension is plainly evident for those who don’t believe exactly as he does. Instead of trying to reach out to people with different beliefs (and underlying value systems), he takes the lazy route and spends time insulting them. Have you ever believed in something you didn’t previously after someone insulted you? No, it’s an absurd and self-defeating strategy. These basic problems underlie most climate change discussions and people retrench their positions instead of trying to step into other’s shoes. I’m not sure how much this has to change before we undertake more widespread and effective climate mitigation strategies. Categories: energy, environment, framing, global warming, meta, policy, science | Tags: 2014 El Nino, Antarctic sea ice, climate legislation, climate policy, energy policy, flood insurance, IPCC, IPCC AR5, IPCC WGII, Ross Sea, solar energy, Tesla | Permalink. It won’t matter unless and until physical scientists leverage expertise outside of their silos and stop executing failed strategies. In addition to summary after summary of government sanctioned peer-reviewed scientific conclusions, scientists now think they need to report on the perceived consensus on individual bases of those conclusions in order to spur the public to action. Regardless of their personal political leanings, scientists are very conservative job actors. They have long-held traditions that are upheld at every turn, which reduces the urgency of their statements. As an analogy, think of a bunch of people sitting down who think for long time periods before any action is ever taken. First, they calmly say there is a situation that requires near-immediate action. Then they say it a little louder. Then a handful start yelling because you’re not responding to their carefully crafted words and they think that you just didn’t hear them or you just aren’t smart enough to understand those carefully crafted words. Then they start screaming because they’re convinced you’re an idiot and screaming will definitely work where yelling and saying those words didn’t work before. Well, the screaming isn’t helping, is it? You’re not an idiot. The volume of words isn’t the issue. The issue is you are motivated by things outside of the climate realm – things like having a job; a job that pays a living wage so you can pay for your mortgage and car payment and keep your children educated and happy. An existence in an affluent world that allows you the time and energy to think of complex problems beyond your perceived immediate needs. If those needs aren’t met – if you have insecure affluence – you place climate change and the environment far down on a list of priorities – just like a majority of other Americans. But the newly released “American Association for the Advancement of Science, the world’s largest general scientific society with a membership of 121,200 scientists and “science supporters” globally” report won’t change this dynamic. While it is important that the AAAS engages scientists and the society it serves, this report is unfortunately just the latest effort by a group of physical scientists that ignores science results outside of their discipline to try to convince Americans that immediate and drastic action is necessary. Like previous efforts, this one will not spur people to action, mostly because the actions listed are about limits, stopping, restricting, reversing, preventing, and regulating. The conceptual model from which these words arise works in direct contrast to the fundamentals of American culture. We are a people who are imaginative, who innovate, who invest. As I have written before, there is no way we will achieve greenhouse gas emissions reductions without substantial investment into innovation of new technologies that we research, develop, and deploy at scale. There is nothing limiting or restrictive about this framework. It it the opposite of those things. This framework recognizes and sets out to achieve opportunities; it allows for personal and cultural growth; it is in sync with the underlying cultural fabric of this country. It directly addresses people’s perception of the security of their affluence in the same way that developing countries’ economic growth allows people to move beyond basic material needs to higher order needs. The reality of insecure affluence among many Americans today might be an indirect outcome of the 1%’s efforts to increase wealth disparity, but it is real. We have to address that disparity first in order to address the real, valid perceptions of insecure affluence. Only after Americans feel their personal wealth is secure will they have the resources to devote to higher order needs such as global climate change. That can happen with concerted focus on investing and innovating a post-carbon economy. But you won’t see that at the top of any policy prescription from the majority of climate scientists. Categories: economy, energy, environment, framing, global warming, meta, policy, science | Tags: AAAS, climate change policy, energy policy, innovation, insecure affluence, investment, physical science, social science | Permalink. Ask and ye shall receive. I recently wrote about what future GHG emissions scenarios included in terms of emission reduction requirements. I have maintained for some time now that most of the IPCC’s emission and concentration scenarios are essentially useless for practical planning purposes. Sure, they’re interesting academically, but we climate scientists can’t just study something for the sake of studying it in today’s tight federal budget environment. In that post, I showed some graphics from a 2013 Nature paper which combined historical emissions as well as projected emissions. Due to the article’s age, I had to search for additional data which showed more recent emissions. 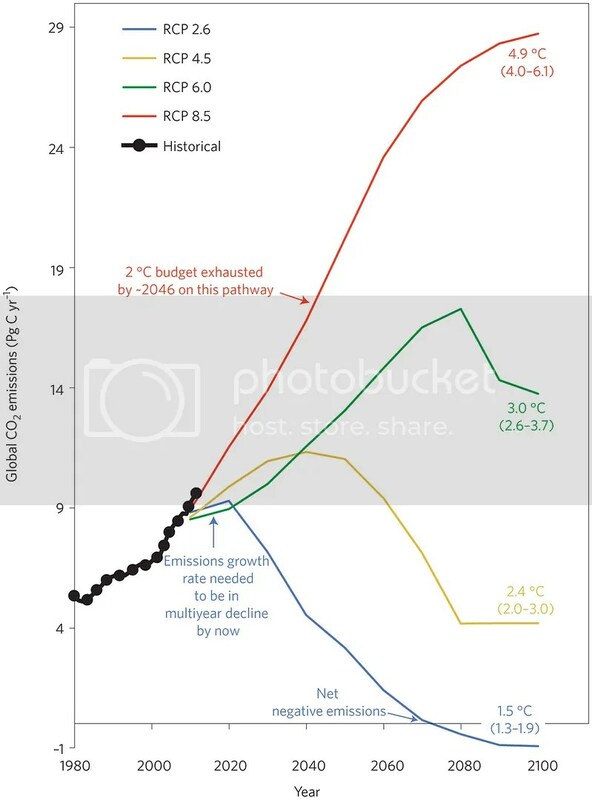 I also showed a simple calculation of projected emissions assuming constant 2.1% annual emissions growth and how different emissions growth would have to be in order to achieve an emissions scenario many scientists characterize as ‘doable’: RCP4.5. Figure 1. Historical (black dots) and projected CO2 emissions from a Nature Climate Change article (subs. req’d). Bold colored lines (red (RCP8.5), yellow (RCP4.5), green (RCP6), and blue (RCP2.6)) represent IPCC AR5 RCP-related emission scenarios. Note that this figure shows exactly what I wrote about in my earlier post: historical emissions are tracking at or above the RCP8.5 scenario. They also exceed the other three scenarios so far in the early 21st century. These differences are relatively small so far (they will grow with time), but the trend difference between historical and RCP2.6 is already important. As the figure shows, if we wanted to match RCP2.6 (and keep 2100 global mean annual temperatures near 2C above pre-industrial), emissions would have to be declining for multiple years already. They aren’t. 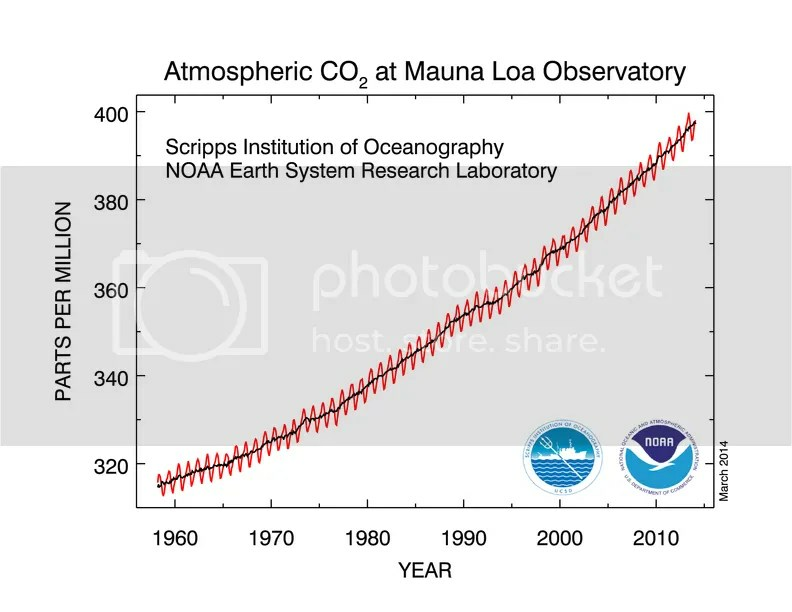 Our actual annual emissions already exceed the annual maximum assumed by RCP2.6. If we were to match RCP2.6 at some time in the future, emission reductions would have to be larger than RCP2.6 assumes, which is currently technologically impossible. It is time to acknowledge that global average temperatures are likely to rise above the 2 °C policy target and consider how that deeply troubling prospect should affect priorities for communicating and managing the risks of a dangerously warming climate. This global temperature target has brought a valuable focus to international climate negotiations, motivating commitment to emissions reductions from several nations. But a policy narrative that continues to frame this target as the sole metric of success or failure to constrain climate change risk is now itself becoming dangerous, because it ill-prepares society to confront and manage the risks of a world that is increasingly likely to experience warming well in excess of 2°C this century. I wouldn’t have used the term `dangerous` because it conveys a judgmental aspect to an objective statement. But that’s personal style. I agree completely with the underlying message. If we have a small (I would say nearly zero) chance of keeping warming below 2°C this century, then 2°C shouldn’t be the target. We can make an infinite number of possible targets, but most of them will be unachievable. How much effort should we put into such targets? How supportive of additional climate policies will the public be if initial targets fail early? These aren’t simply academic questions. Many climate activists think they’re convinced of how important action is, but their rhetoric doesn’t support that conviction. They’re more ideological than they’d care to admit. I met someone at a talk at the University of Colorado on Monday and ended up having lunch with them to exchange economic information for climate information. I tried to convince them of the need to switch targets now, to no avail. I ran into a basic problem of climate communication. This person has a worldview and I was in the unenviable position of trying to modify that worldview. Just as many climate communicators try to do with climate skeptics. It’s incredibly difficult to do this because you’re dealing with a lifetime of information and experience overlaying a biology that is predisposed to that very worldview. I will continue to post about historical versus projected emission/concentration pathways. If activists really are supportive of the objective science as they claim, I think they will eventually shift their target. They will of course have to come to terms with what they will initially perceive as a failure. But the faster they can do that, the sooner we can set more reasonable and achievable targets and start making headway towards mitigation. Categories: environment, global warming, policy, science | Tags: CCS, climate communication, climate policy, climate research, energy policy, historical CO2 emissions, IPCC, projection CO2 emissions, RCP scenarios, RCP2.6, RCP4.5, RCP6, RCP8.5 | Permalink.